A pitched 140 g baseball, in horizontal flight with a speed Vi of 39.0, is struck by a bat. After leaving the bat, the ball travels in the opposite direction with speed VI’ also 39.0. (a) What impulse J acts on the ball while it is in contact with the bat during the collision? SOLUTION: The Key Idea here is that we can calculate the impulse from the change it produces in the ball’s linear momentum, using for one-dimensional motion. Let us choose the direction in which the ball is initially moving to be the negative direction. (b) The impact time for the baseball-bat collision is 1.20 ms. What average force acts on the baseball? SOLUTION: The Key Idea here is that the average force of the collision is the ratio of the impulse J to the duration III of the collision. 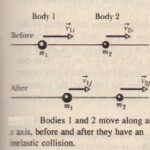 (c) Now suppose the collision is not head-on, and the ball leaves the bat with a speed VI of 45.0 mls at an upward angle . SOLUTION: The Key Idea here is that now the collision is two-dimensional because the ball’s outward path is not along the same axis as its incoming path.